Arrange biscuits on baking sheet. Press the bottom of a 2 1/2” cup into the center of each biscuit, creating a “nest.” Mold dough around the glass as needed to create a deep indentation surrounded by even edges. Bake for 10 minutes, remove from oven, press down the center of the biscuits once more, and return to oven to bake for 10-12 minutes more, until golden. On the stovetop, scramble together eggs, cheddar, cream, salt and pepper. Warm carnitas in microwave or on the stovetop. 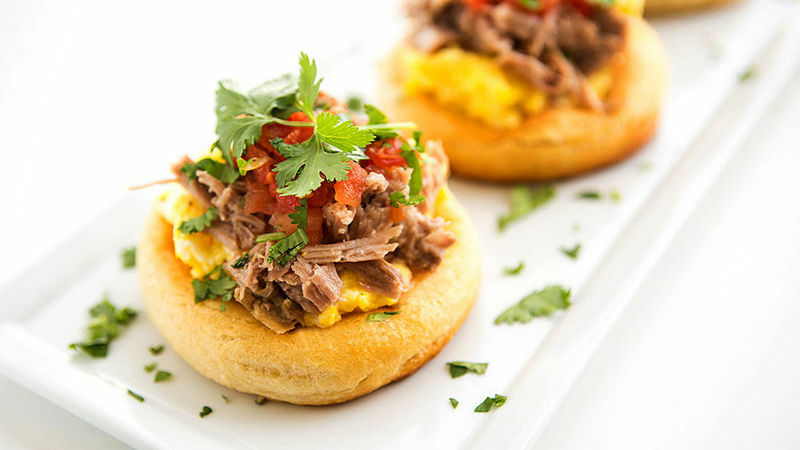 Fill warm biscuit nests with scrambled eggs, top with carnitas and salsa. Garnish with cilantro. You can find ready-made carnitas in the refrigerated section of most grocery stores. Or make your own with an easy recipe like our Slow-Cooker Carnitas. Remove dough from the fridge 15 minutes before using for best results. Using a slightly warmer dough makes it easier to mold the nests.